Follow this easy recipe to make Sarabeth’s Pancakes. A breakfast-and brunch-favorite, they're delicious with Sarabeth's preserves. Toss in some cooked wheat berries (whole-wheat kernels that you’ll find in natural-foods stores) for a subtle chewiness. Blueberries are a delicous addition, too. 1. Put first 5 ingredients (through salt) in a large bowl and stir with a whisk; make a well in the center. Put egg yolks and milk in a medium bowl and stir with a whisk until blended. Pour the milk mixture into the well of the dry ingredients. Using a wood-en spoon, stir just until the batter is mixed. Do not overmix (a few tiny lumps of flour may remain). 2. In a small bowl, beat the egg whites with a hand mixer just until soft peaks form. Gently fold the egg whites into the batter. 3. Preheat a large nonstick pan. Add 1 teaspoon of the butter and heat over medium-high heat. Reduce heat to medium. 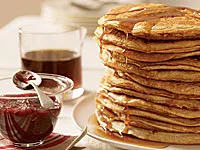 Using 1/3 cup for each pancake, pour the batter into the pan, leaving 1 inch between pancakes. Cook until tiny bubbles form on the surface of the batter, about 2 minutes. Turn the pancakes and cook until the other side is golden brown, about 2 more minutes. Keep warm.